“School’s out for summer” – almost, believe it or not! Wondering how to tell your schoolhouse staff they rock? Here are seven thoughtful, no-fuss gift packs that teachers are sure to appreciate, hot off the press of the latest issue of Disney FamilyFun magazine. Stamps of Approval: These sweet stamps let teachers say “great job” with ease, and they come together fast from cork and adhesive-backed craft foam. Favorite Reads Photo Bookmark: Thank the teacher for making reading fun with a bookmark that lists your child’s new favorite titles. Happy Travels Car Sachet: Stuffed with a sweet scent, this little luxury makes a great gift for a teacher who may be hitting the road this summer. Painted Thank-You Mug: With the stroke of a paint pen made for pottery, kids can turn an ordinary mug into a useful keepsake. Fun Fingerprint Stationery: Let teachers know how they made a big impression with a set of (truly) hand-printed cards and envelopes. Bundled with stamps, this one-of-a-kind gift will make summer correspondence even more fun. From the Whole Class- Sow Giving Tree or Give a Crate (or a barrel!) of bulbs: Surround a potted plant with a grouping of card stock envelopes shaped like flowers, or pack up a gardening kid for an all-natural way to say thanks for helping kids thrive. 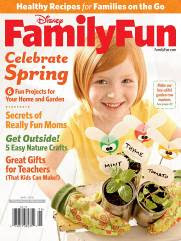 For more great ideas that will make teachers feel special visit http://familyfun.go.com/schools-out/schools-out-teacher-gifts/teacher-gift-ideas-855379/. Thank you Disney FamilyFun magazine for the fantastic ideas!